Temporaily Out of Stock. 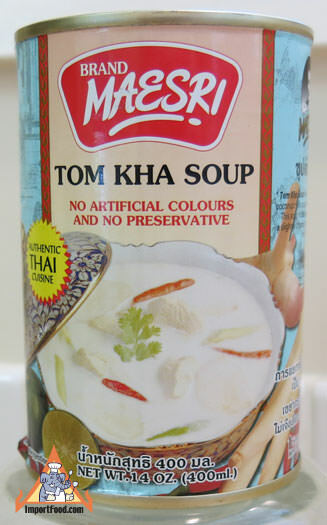 This is a good quality canned tom kha that has "real Thai taste". Made by high quality Maesri (mostly famous for their curry paste products, which are used by many restaurants around the world). Just heat and serve. We added sliced chicken, a few fresh Thai chile peppers (but there are already some in the can), and topped with fresh coriander. Serve with a bowl of jasmine rice for a delicious meal. Also see our extremely high quality Amazing Elephant Tom Kha soup offered below. Ingredients: coconut milk, water, oyster mushroom, lemongrass, galangal, sugar, straw mushroom, salt, fish sauce, lime juice, coriander ,fresh red Thai chiles, kaffir lime leaves, citric acid. No artificial colors, no preservatives. Product of Thailand.